I recently re-discovered an old journal of mine that I thought I had misplaced. 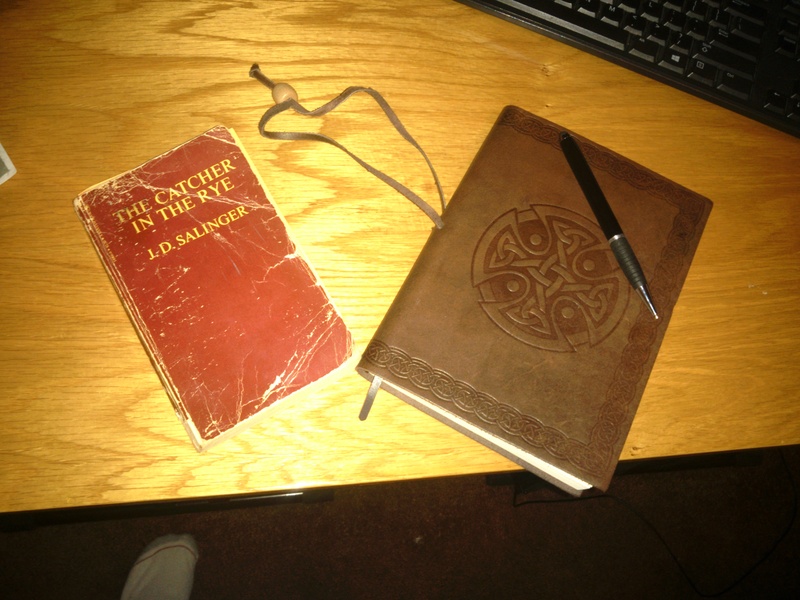 In fact, I think I misplace this journal every couple of years or so, because every time I find it I think to put it some place safe, and then forget where that place is. I wasn’t looking for it, specifically, this time. This time, I was just putting away some paperwork, and there it was. Also, recently, I’ve started writing in a new journal. It was an idea that I came up with in the context of recent therapy sessions, and it has been helpful to have a safe space to write about things that are too personal, even for me. As readers know, I have not been shy about writing about some personal issues here, and that will not stop, but there are some issues I will not write about publicly. I’ve also started re-reading The Art of War, by Sun Tzu. In the early chapters, I ran into the idea that all warfare is based in deception. The next line said “if able, appear unable.” In other words, make yourself appear weaker than you are. Or, at very least, do not present yourself as you are, so that your enemy cannot properly size you up. One can deceive a person for the truth’s sake, and (to recall old Socrates) one can deceive a person into the truth. Indeed it is only by this means, i.e., by deceiving him, that it is possible to bring into the truth one who is in an illusion. The context of this quote, according to this source, is about why Kierkegaard sometimes wrote as if not a religious person (supposedly to lead people to Christ, as Kierkegaard was a Christian Existentialist). But I think it has some significance outside of this parochial context, and I think it can tell us something about human behavior which is worth some consideration. I don’t want to dig deeply into that at the moment, but I think the most interesting thought embedded in there is the nature of illusion; is not illusion relative? Is not one who is in error prone to see the truth as an illusion? How human is it to be caught in a narrative which is quite delusional, but because one is within that web it appears sensible? Cults, religions, and even some cliques operate in just this way, and sometimes the only way through the miasma might be some creativity with perspective. The mind is crafty and agile. The mind that wants to believe will, and it will move not only the goalposts, the ball, and the kicker but it will often shift the field upon which it plays in order to keep the illusion of coherence. It’s harder to hit a moving target. It’s hard to hit what you can’t see. Stealth, in other words, is an advantage in war. Is that analogy apt? Are we at war? And who are “we”? Civilization? liberals and conservatives? Exes? Family? For many years, I have advocated transparency. I’ve been open about my flaws, mistakes, and struggles as a person who very much wants personal growth and improvement. And this strategy has been a mixed bag. It has led to some intimacy with people I’m close to, but it has also been taken advantage of by people who like to control people and narratives. And by a person who is especially good at, or at least has a strong desire to utilize, such control and who is also especially good as deception, open war would be fruitless and possibly unwise. I don’t really have anything more to say on the subject right now, but I’ll end with a few thoughts about where I’m headed. I’ve been very quiet recently. Last year was a very traumatic and stressful one for me. But do not be deceived; I am not going away nor am I defeated. This year is a new one, and I am feeling better all the time. I’m gaining strength that I did not previously have. I do not fear anyone, or anything, because I have no reason to hide. My pain has only made me stronger. Deception may be an art of war, but I have yet to decide whether I want to wage war or simply stride along my path impervious and uninterested in the distractions off to the side. So long as the distractions stay to the side, and do not land in my path forward, I will not focus on them. My path, however, is wide and it includes friends, organizations, and some parts of the polyamorous, atheist, and skeptical communities. The debris which previous warfare has left behind me is not forgotten, however. This is not a washing of the hands, forgiveness, or anything of that nature. Far from it. This is a desire to move forward unmolested, if that’s possible. Posted by shaunphilly in Culture and Society, Personal, Polyamory. All of us carry some amount of pain within us. We, being prone to error, hurt one-another. Hopefully, this pain acts as a teacher, and as we grow, mature, and learn we become more aware of the causes of such things and our capability to hurt weakens. The strength to hurt, to control, and to manipulate are, after all, not reverent strengths. I have my own pain, carried from various periods of my life. Some stems from childhood, but much of it stems from adulthood. The mistreatment I received over the years worked its way into my bones, and gave me a ubiquitous feeling of not deserving better or even being capable of better myself. I simply got used to not asking for, fighting for, or even feeling worthy of not being treated poorly, which has the all too common effect of not always seeing others worthy to not be treated similarly. Slowly, deeply, and blindly, I became a man who accepted mistreatment, receiving and giving, all too easily. From this was born the quiet, mostly invisible, and powerful demon of resentment, frustration, and ultimately a deep anger which permeated most of my adult life and relationships. In short, pain begets pain. All this came to a head in the last year, and I’m glad it’s almost over. All of the trauma I had received previous to the last year or so became magnified by newer events so damaging that I could no longer keep the resentment, pain, and anger within the armor I created to keep my emotions away from those who I wouldn’t allow myself to trust or get close to. I’ve written about some of this before, including when I told my version of what happened with the split up of our former house. In retrospect, I left a cult. The resulting waves, including false narratives and cold war which has sucked people into the cult-like area of influence, has been utterly ridiculous and beyond painful. Those events have been the traumatic trigger for much of the mistakes I have made in the last year, and may have repercussions of many years to come. In the last year, the raw amount of pain from earlier periods in my life became so bad, so unbearable, that I began to lash out at the people closest to me while not realizing how much pain I was in. As a result, I lost relationships of immeasurable value to me, some of which I will never regain. What’s worse is the demonization I received from some of those parties. Just more fire to the trauma bonfire, I suppose. These days, my thoughts are full of regret, loss, and the reminder that learning a lesson too late is almost always unhelpful. And what’s worst is the fact that most of it was completely avoidable if I had been less self-absorbed, selfish, and had instead listened to those who were trying to help. Not all of it was unavoidable, of course. Some people are too interested in being right, winning, and petty schadenfreude to have had some of what has happened go any other way. But with others, the damage could have been avoided. And for that I am immeasurably sorry. Let my enemies raise their glasses in triumph upon my admitting, again, my mistakes. Let them trumpet their flat songs and revel in their illusory superiority insofar as their delusion allows them to think their dank cellars to be castles. Allow those who care little for empathy or introspection beyond the tip of their noses to laugh and gloat in an illusory sense of triumph over those they abuse. I care not of the opinions of people too narcissistic and myopic to grow or learn from mistakes. I shake off the dust from my feet upon leaving their abodes and seek out better, healthier, lands. I have been, especially most recently, in error. But the error was not mine alone. I, however, will take as lessons what errors were truly mine, and I will not place blame where it does not belong. I will not take upon myself full blame, nor will I shrug it off onto others when it is tailored for me. My pain is not an excuse, even if it might be an explanation. My fear, compelling as it is towards acts of desperation, has ruled all too often and subsequently has upturned the potentially flat stones upon which my future path may have been otherwise laid. The ground before me now is unsettled, uncertain, and I have only to become more comfortable with that terrifying foreign land of The Unknown. Knowing that I still have wonderful companions along such a path is heartening. Today, however, I step off the path, briefly, in order to risk the reflective and refreshing nature of the calm waters there. The fears of its depths are visceral, but perhaps nothing is more terrifying than the nature of it’s placid surface. For nothing is as terrifying as the depths within us, reflected in quiet and still moments besides our paths. The dark nights of the soul will haunt more than any external spectre. In the calm, quiet, depths of the night you can no longer run away from yourself. Assuming, of course, you are sensitive to your own light and darkness, these quiet moments will sometimes compel insomnia and self-criticism. And yet some seem to be immune to the disquieting contrasts that the blinding light of solitude create within us, not seeing the shapes of the shadows that exposure and attention engender. Some people can’t be self-critical because they are blind to their own flaws. I am reminded of J.S. Mill’s question of Socrates and pigs, and a tangential concern springs to mind; is it better to remain aware of our flaws and errors and unsatisfied or unaware and satisfied? Is it better to be content and ignorant of these contrasts within our dark souls? That is, is it better to see ourselves as righteous when none of us are? Would it be better to blind ourselves, like old Oedipus, to the truth of our condition? It’s all too easy to say that we should live in such a way that we do not regret, for when the regretful act is done no amount of living well can undo such an act except to learn from it, perhaps. Avoiding the reality of our responsibility, whether due to lack of concern or because it is too painful to reflect upon it are sociopathic and tragic, and will not lead to growth in either case. We need the moments of stillness, introspection, and reflection besides our paths, if we care about truth and our relation to it. In the stillness between steps along the paths we traverse, the waters within and around us settle and we are forced to reflect or to keep moving in order to disturb that reflective surface and ignore that reflection. Stillness and quiet are imperative for those willing to surpass the depths within. Noise, motion, and distraction are the tools of those afraid of the abyss. How many might wait for others to stand still besides that water, all the while dancing about themselves, in order to watch another ponder their own reflection while they, dancing or playing with their phones, to try to co-op the narrative of such reflection? Is this, itself, not a failure of meta-reflection? Is this, in a way, another kind of distraction? Is this not ultimately avoiding one’s own reflection? Is this, in some sense, among the more terrifying capabilities we humans have, to look into each other and either fail to see ourselves or to see ourselves and not recognize what we see? Is it more terrifying to see our own depths, or to see that we all share the same depths and are reflections of one another? Such a realization might imply a kind of obligation stemming from that commonality. 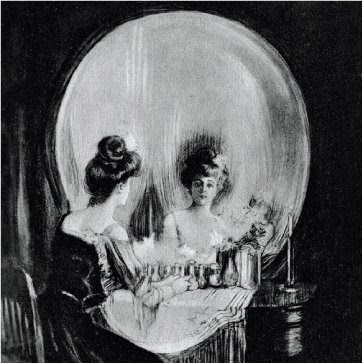 Such realizations might also uncomfortably seat us next to those we most despise, where we can think we are looking at their reflection when, in fact, we are looking at both of us or merely ourselves. But perhaps most terrifying is that it might reveal that those we love can as easily be hurt by us as they can hurt us, and that all it takes is the smallest amount of self-deception that we, individually, might matter more than them. How easy it is to hurt those we love, and how unfortunate that it’s so difficult to undo. When stones start to break the surfaces of those waters between us, it becomes much harder to see anything but chaos, pain, and to lose sight of those terrorizing reflections. For it is only the still waters which allow introspection. Selfishness and blindness are two of the sources of cruelty and distance, I think. And when the pain is passed onto the next person, is it any surprise when some of those people no longer wish to walk along the path with you or stop along it to reflect along-side you? Is it any surprise that when you throw your stones at the waters, those who seek that stillness and quiet will seek out calmer waters elsewhere? No. It is terrible, but it is no surprise. And so, I believe, I think it’s better to at least be capable of keeping our own waters calm, from time to time. When we lose that reflection for too long, it’s quite likely that we are contributing to the lack of stillness. It is quite possible that we are distracting ourselves with noise and motion, and we cannot see ourselves or each other. I hope that I can more often find that stillness, calm, and the wisdom that comes with it. It’s hard, so very hard, in the turbulent water in with I now swim, but the storm is no longer raging and I’m finding more and more of myself being reflected back by momentary facets of the increasingly calm waters. When one is focusing on quieting and calming the mind in order to allow those reflective waters to present ourselves and those closest to us, only the truly malicious can continue to harm. I am many things, many of them unflattering to the image I would wish to reflect, but maliciousness is not one of them. But I have seen maliciousness. I have seen the face of (at least) one person who, in the calmness and quiet, sleeps well despite the fact that the water around him is only still because he has just drowned the flailing victim who insisted upon threatening his contentedness. So long as I never become that, I can be content that my mistakes can be healed. Allow me to offer a sort-of prayer to myself, there being no ultimate authority upon whom’s lap I can lay such an entreaty. Let me not conflate those unworthy and empty souls with those who have been undeserved second-hand bearers of my own pain. Let me not mistake those who are deserving of criticism and pity with those who, in short, are not. Let me not follow my path thinking that I am solely harmed, when I too have acted deservingly of criticism within the bounds of my own will and capability. Let my preferences, perspectives, and limitation not be the gravitational center of narratives which I retell further down my path. Let the mistakes lie where they are, and not add flavor or putrid nourishment to the future of my narrative past. Let not the story I tell myself, my very consciousness and self, becomes embedded in pretty lies. Let others spin their narratives as they will; I can only hope that such predators will eventually be seen for what they are. Finally, let me finally be able to love myself, whether or not other people hate me, smear my name, leave me, or stand beside me. My pain will not rule me forever, and my fear will no longer be my mind killer. Only when I can truly love myself can I love others well and accept their love. I get closer, every day, to that abstract and unreal goal. There is no perfection or completeness in such a journey; only the path, one step at a time. May I always remember that while only death is the end to such a journey, at each moment I have arrived at myself, and that’s a pretty great place to be.